New Delhi: UPES, one of the premier universities of North India, organized a mega career and counselling event ‘Unleash’ for the Delhi students. Youth icon and best-selling author Durjoy Dutta, wowed students and parents alike with his inspiring life journey. They also got an opportunity to experience the beautiful and well- equipped campuses of UPES in Dehradun through virtual reality. Around 450 students, and parents attended UPES ‘Unleash’ event. 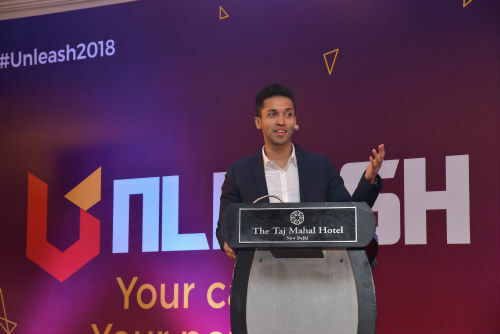 A mechanical engineer and management graduate by qualification, in his keynote address Durjoy Dutta advised students to “have short-term and long-term goals in terms of education, career, and passion and personality development and be serious about them”. “I realized I have the power of words. You need to realize your own powers”, he further added. Senior faculty member at UPES, Loveraj Thakru, counselled the students present at ‘Unleash’ event and said, “UPES has designed specialised programs in engineering, computer science, law, design and business. Curriculum of these programs is updated every year in consultation with our industry partners to ensure that our courses are completely aligned with what the industry demands. This also ensures that our students are highly employable”.